January 20th 1973. Years after he was known as "The Killer," a rock pioneer who released such rock standards as "Great Balls of Fire" and "Breathless," Jerry Lee Lewis made a name for himself in a very different musical genre: country. And on this day in 1973, he capped off his road to country stardom with an appearance at the famed Grand Ole Opry. 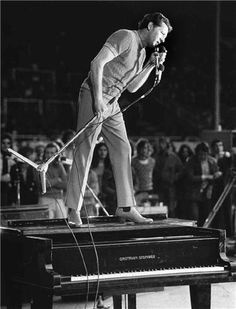 Like his contemporary Elvis Presley, Jerry Lee Lewis grew up in a place where the musical traditions of the poor and white overlapped and intermixed with those of the poor and black. Just south of the Delta heartland that gave birth to the blues, Lewis's hometown of Ferriday, Louisiana, also sat in the heart of territory critical to the development of country music. The sounds emanating from the churches, dance-halls, juke-joints and radios of Ferriday were precisely those that would coalesce into rock and roll: black gospel, white gospel, boogie-woogie, Delta blues, rhythm and blues and Western swing. The line separating country from rock and roll was particularly blurry during Jerry Lee's rise to fame, when songs like "Great Balls of Fire" and "Whole Lotta Shakin' Goin' On" rose higher on the country charts—all the way to #1—than they did on the pop charts. The line was much clearer by the late 1960s, when Jerry Lee Lewis, long since shunned by the pop establishment over his controversial second marriage, reclaimed part of his musical roots by staging a hugely successful comeback behind country hits like "Another Place, Another Time" and the brilliantly titled "What's Made Milwaukee Famous (Made a Loser Out of Me)." The comeback reached a high point with his invitation to the Grand Ole Opry, where, on this day in 1973, Jerry Lee put the full complexity of his musical background and colorful personality on display. "I am a rock-and-rollin', country-and-western, rhythm-and-blues singing [expletive deleted]!" Lewis declared from country music's greatest stage before launching into a rousing set that included all of the late 50s rock-and-roll classics he'd promised Opry officials not to play.